All of us at Sentry are gratified that so many in the HOA and condominium association industry thought so highly of Sentry to cast their vote for us. Florida Community Association Journal (FLCAJ) magazine announced its fifth annual Readers’ Choice Award winners in the March 2018 issue of the magazine. 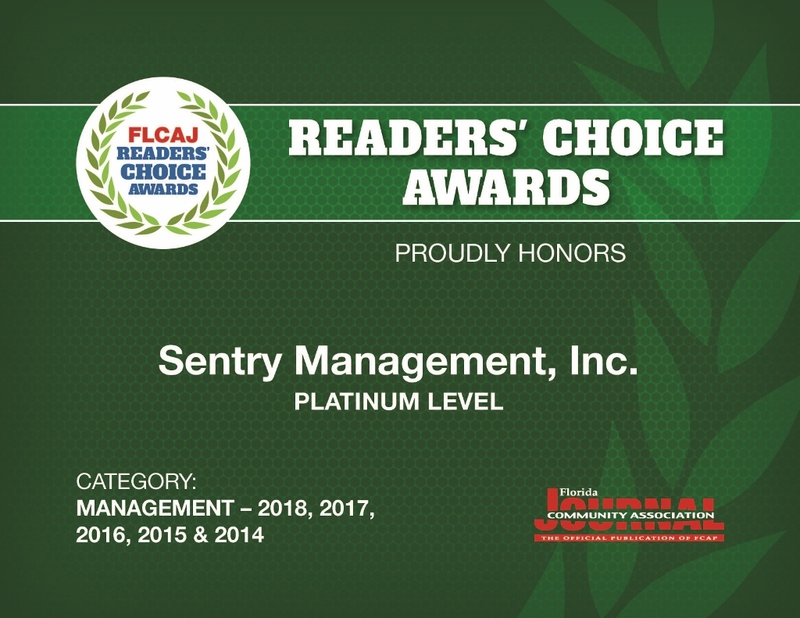 In the category of Best Homeowners Association Management Company, Sentry Management won Platinum Level accolades again this year, achieving the highest honor every year since the program began. Since being founded in 2013, the Awards have grown every year, with more than 390 service providers nominated for this year’s awards and more than 7,500 votes cast. Winners are chosen based solely on the total number of votes. Sentry Management is a full-service community management company. Sentry’s business is the day-to-day operation of communities, homeowner associations and condominiums. Sentry is accredited as an AMO® (Accredited Management Organization) by the Institute of Real Estate Management, providing independent evaluation that Sentry has one of the highest operating and financial standards in the industry. Sentry operates in dozens of localities in Florida, Arizona, Colorado, Georgia, Idaho, Iowa, Indiana, Maryland, Missouri, New Mexico, North Carolina, South Carolina, Tennessee and Virginia.